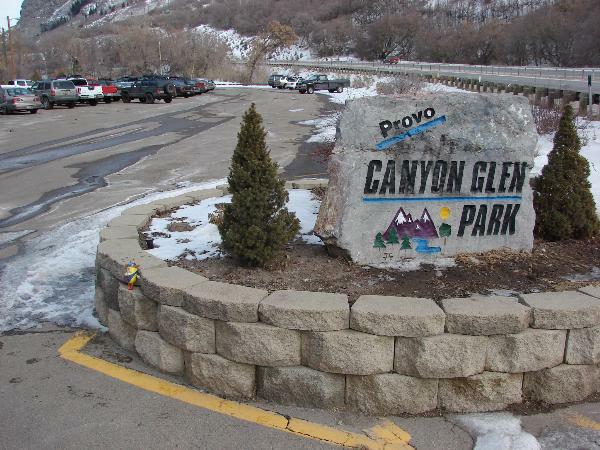 There are several nice parks in Provo Canyon, above is Canyon Glen Park. Provo Canyon takes you from Provo, North-East up to the Heber City area, there are many gorgeous views, waterfalls, cliffs and colors. The Provo river winds through and is often filled with fly-fisherman and rafters. I have seen many deer, bald eagles and a moose among other more common wildlife. 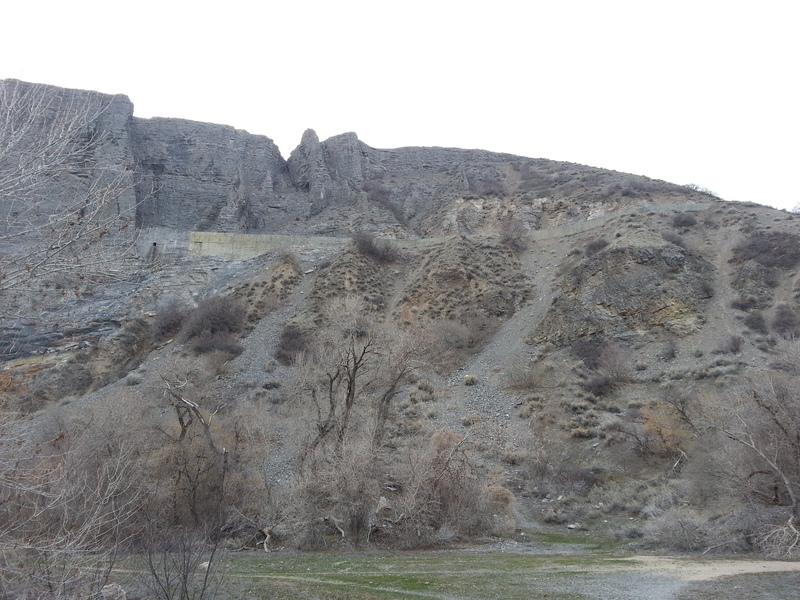 There is a lot of history in Provo Canyon, most based around the river and water usage. Do you hear running water? Am I Getting Hazard Pay? 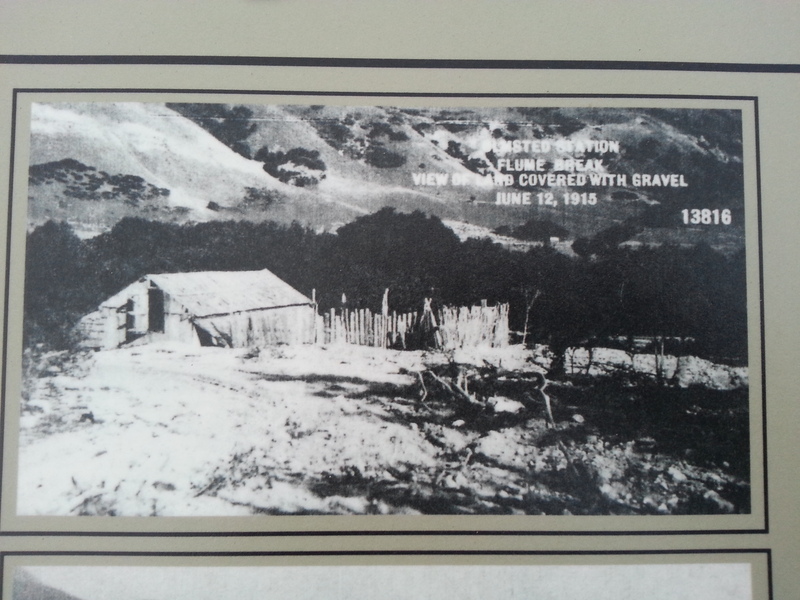 The Canyon was an alternate route into Utah Valley and plans were made to fortify the road against the U.S. Army. 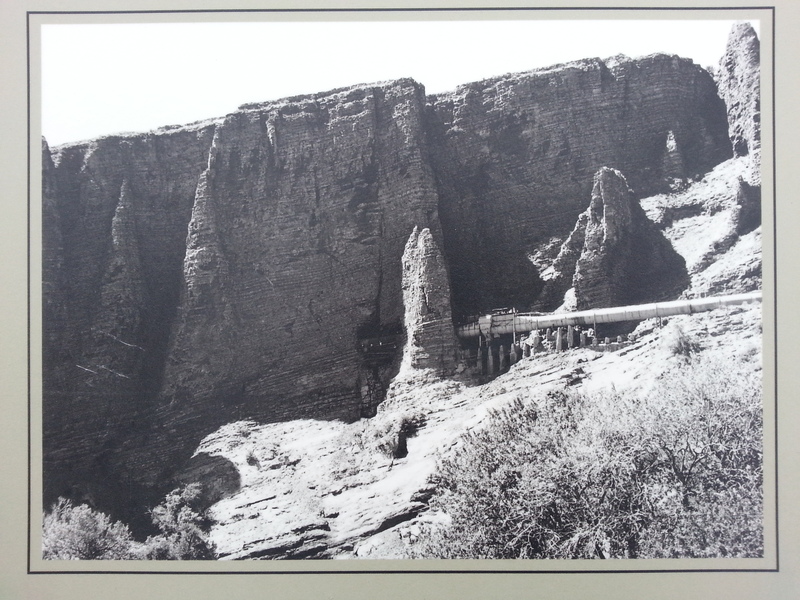 The Provo Canyon Guard Station was constructed in 1857 as a possible defense agaisnt the advancing U.S. Army during the Utah War. 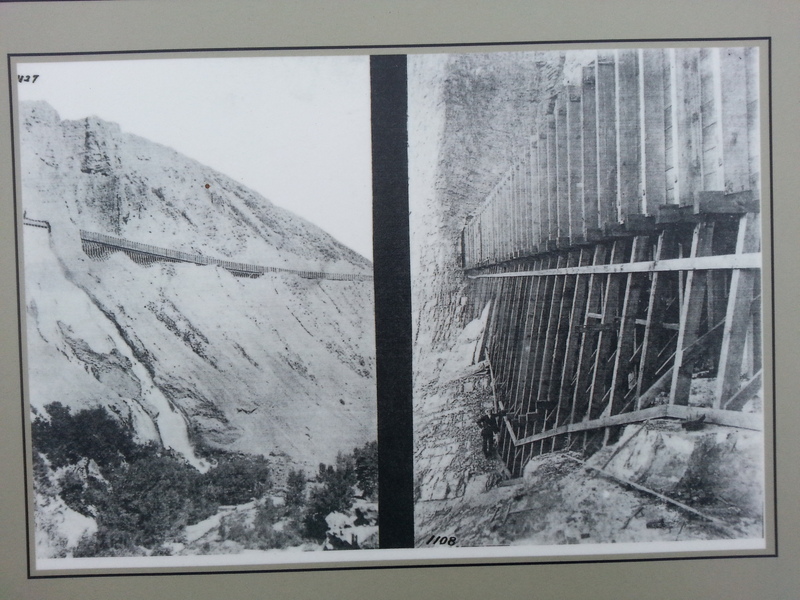 The new road through Provo Canyon was completed in 1858, after the Utah War began. 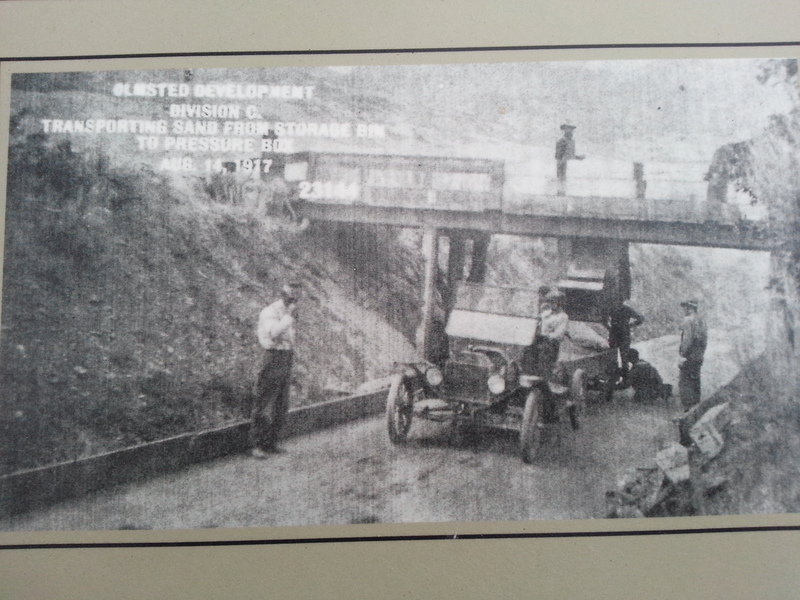 Because the road was not federally owned, but was operated by the territorial government, tolls were charged for maintenance. 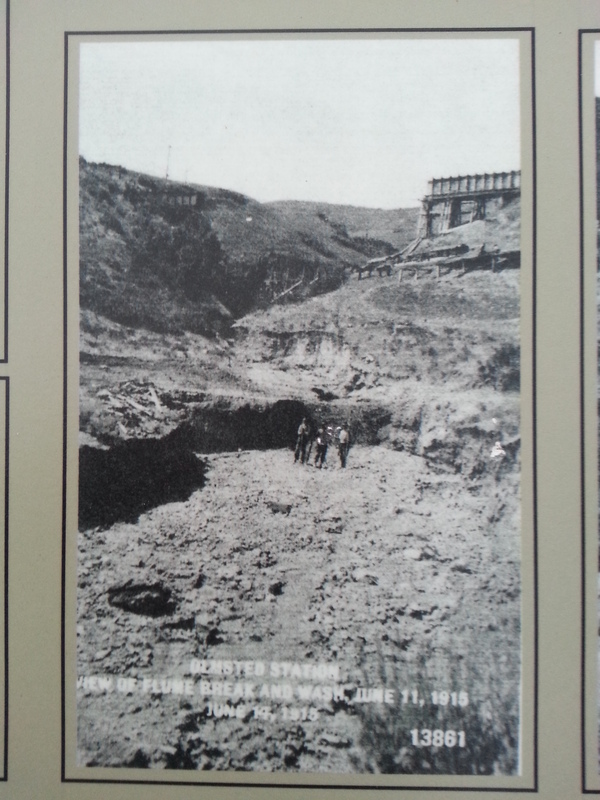 In 1899, the Rio Grande Western Railroad came to Heber and started grading for the Provo Canyon line. 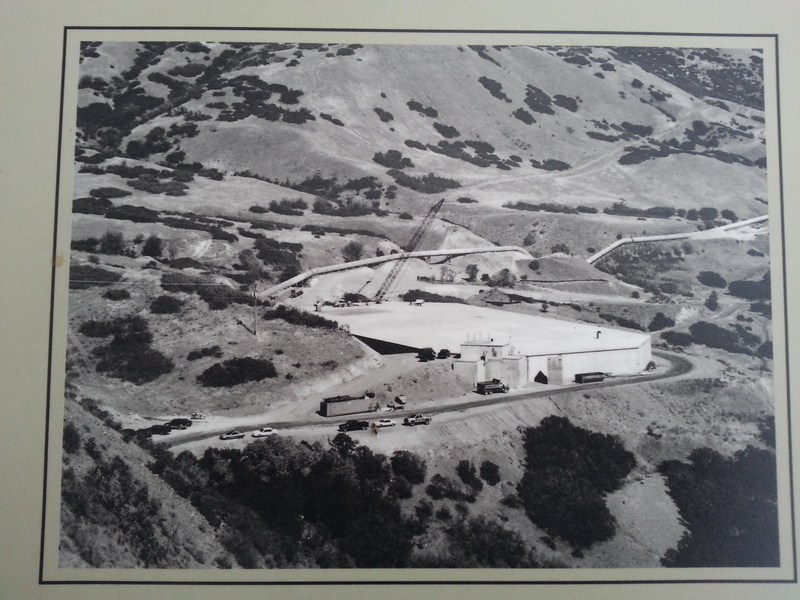 The railroad continued to operate for over seventy years. It was very active in transporting large numbers of sheep to distant markets as Heber Valley became known as the sheep shipping center of Western America. The line was abandoned in 1969 by the Denver and Rio Grande railroad. 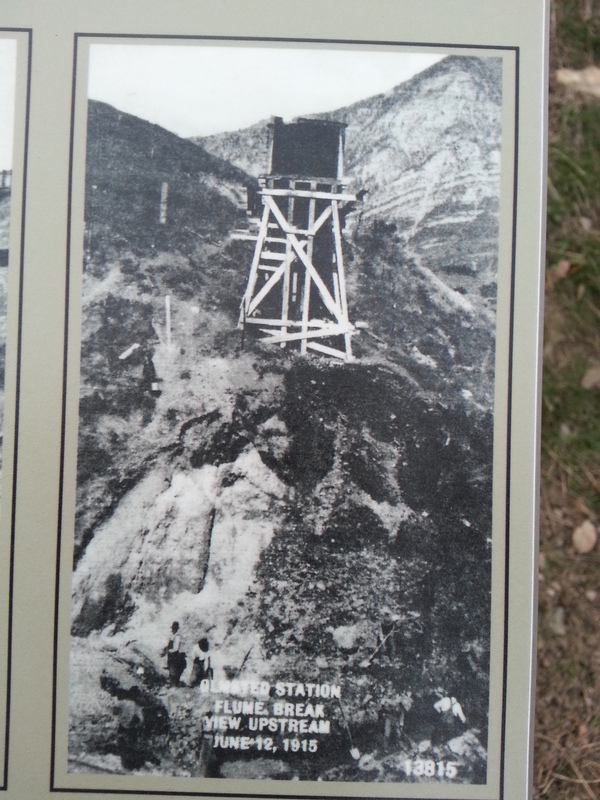 Tracks were mostly removed and only those between Bridal Veil Falls and Heber were kept in place. 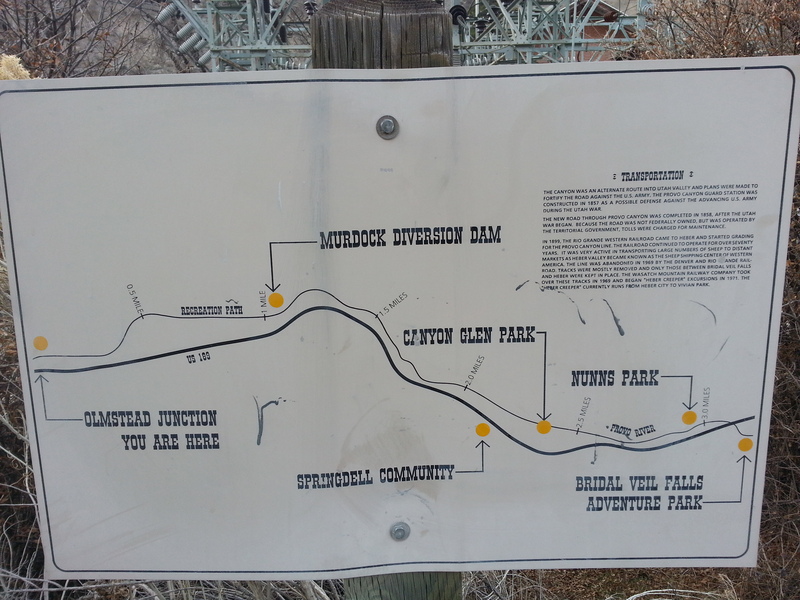 The Wasatch Mountain Railway Company took over these tracks in 1969 and began “Heber Creeper” excursions in 1971. The “Heber Creeper” currently runs from Heber City to Vivian Park. 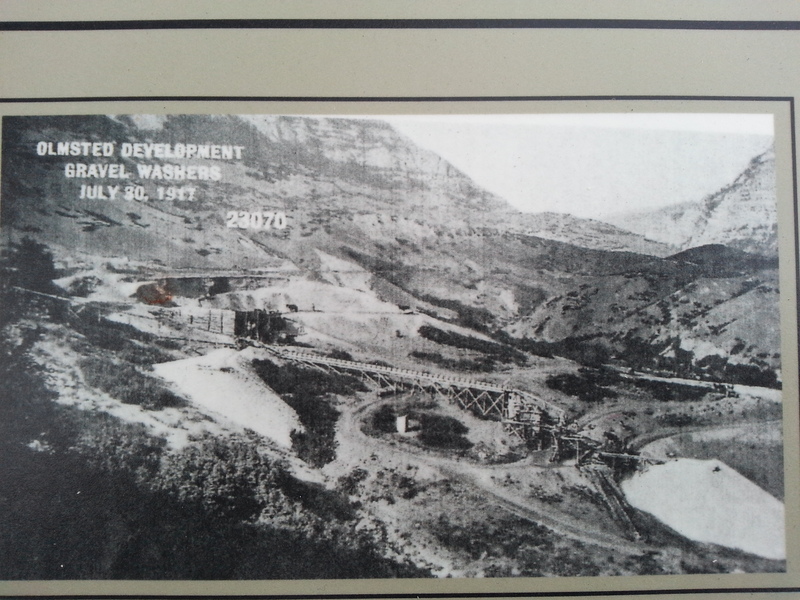 The Olmstead Power Plant is at the mouth of Provo Canyon. The Olmstead Spillway is seen up to the west as you’re entering the canyon, if you looked at the cliffs in 1904 this is the spillway for the Olmstead Flume you would have seen. Notice the size of the timbers used for construction and the water spilling from the overflow. 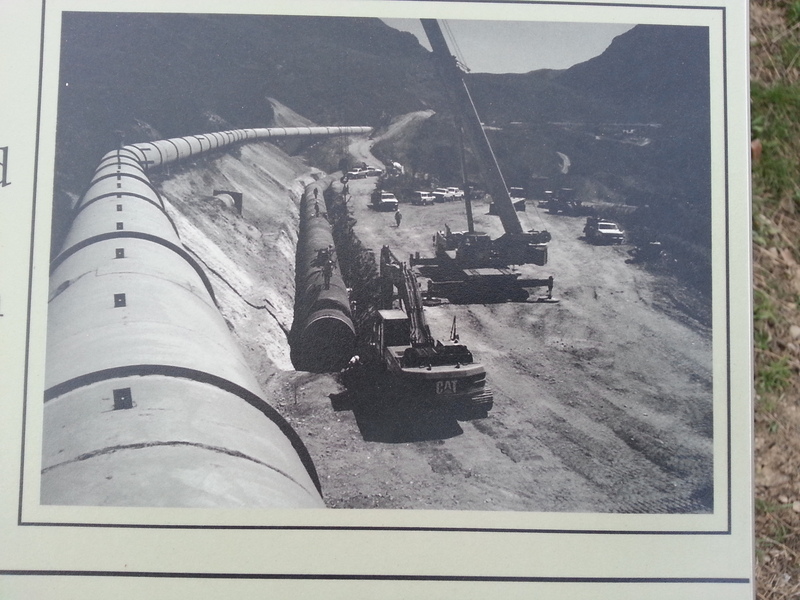 In 1949, the wooden flume was replaced with a steel pipeline and a siphon spillway instead of an overflow spillway. 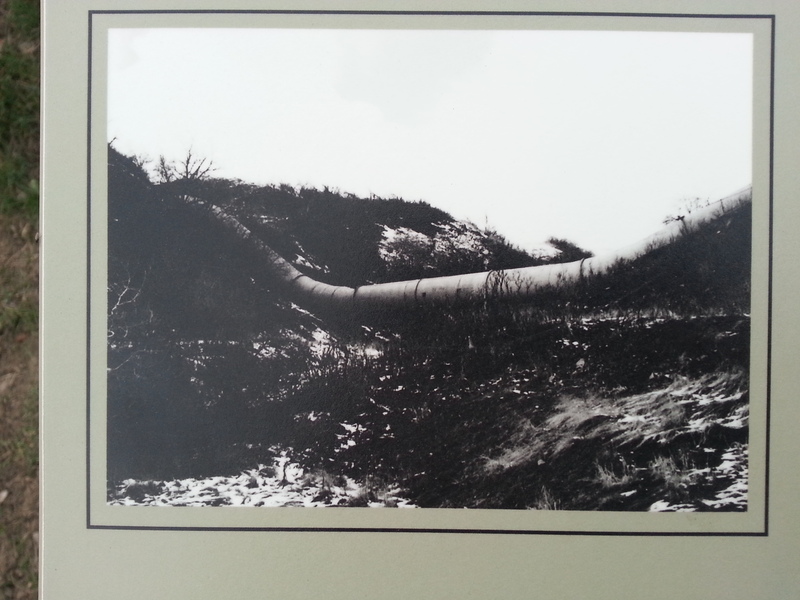 The pipeline shown in this photo is encased in concrete in the next photo. 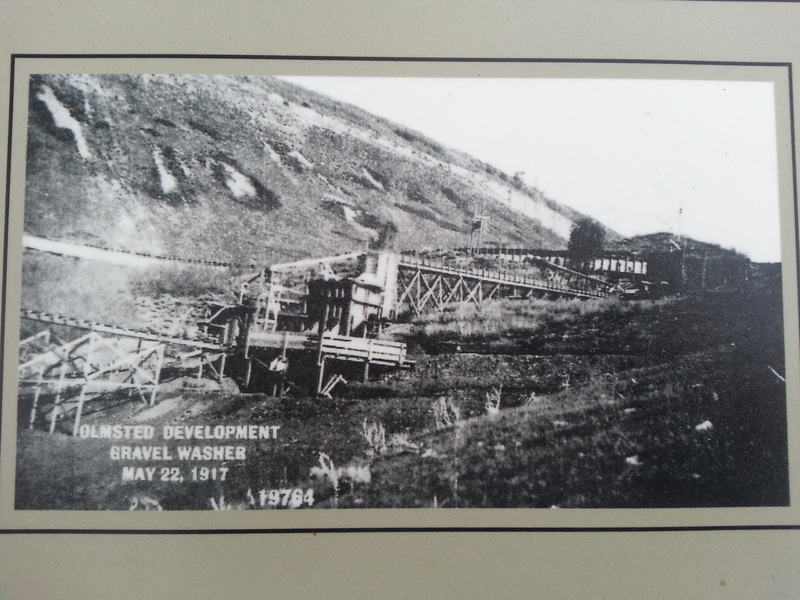 On a hill a little past the spillway, a large gravel screening operation was set up to provide sand and gravel for the construction of new footings and the pressure box for the wooden flume. A reservoir was later constructed here. 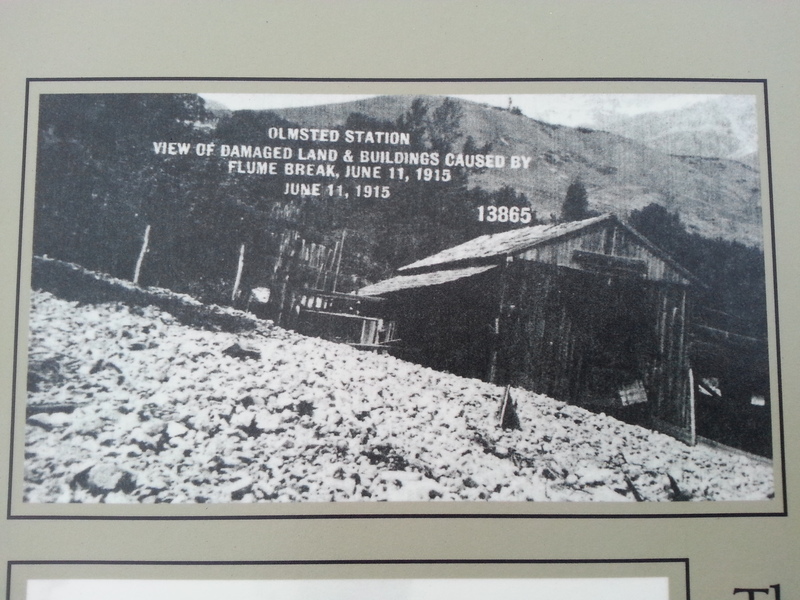 In 1915, just north in the Canyon, the wooden flume broke and flooded a farm. 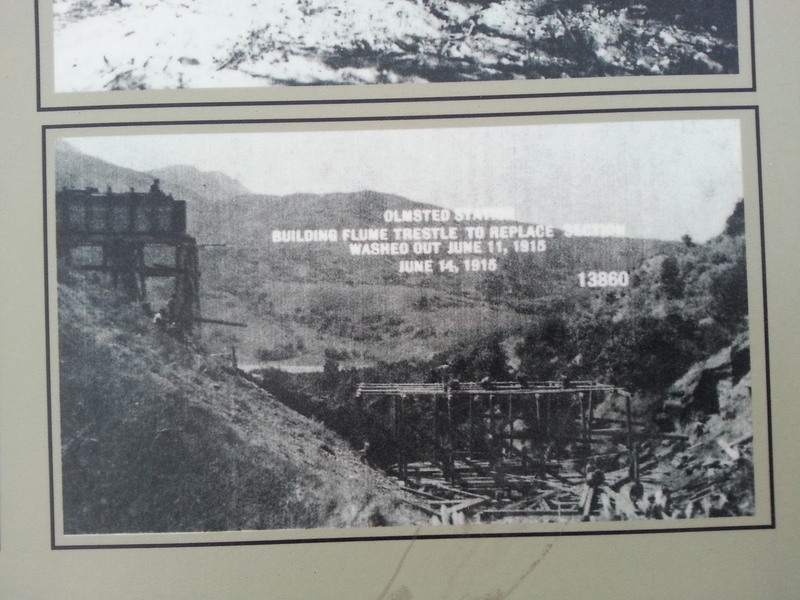 The flume was repaired and eventually replaced in 1949 with a pipeline and an inverted siphon. In 2005, it was replaced again with a buried steel pipe. 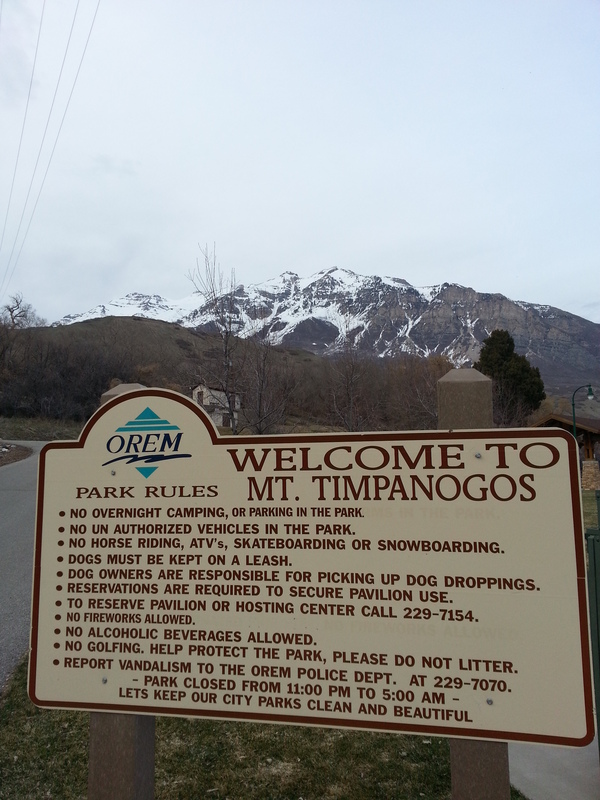 The Timpanogos Park is now where the farm once stood.